Zoya added texture and sparkle and discovered the secret to ultra, long-wearing matte nail color! When the color development team at Zoya Nail Polish created the best-selling Zoya PixieDust™ Nail Polish colors, the focus was on a stunning, textured, matte formula... 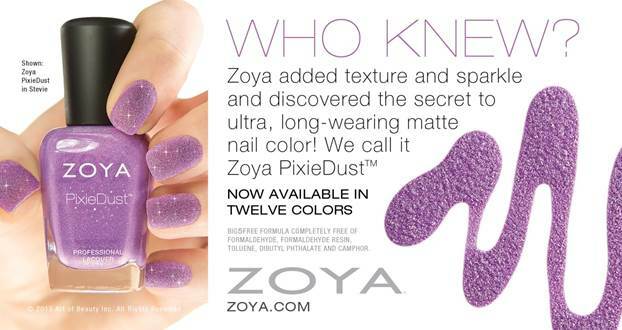 The unexpected BONUS was the long-wearing nature of Zoya PixieDust™ Add to that the easy application that requires no base or top coat and the stunning palette of twelve fresh shades for a result that equals pure Zoya PixieDust™ magic! Textured or Matte not your thing? Not a problem – The incredible extended wear of the Zoya PixieDust™ formulation also looks just as amazing with a glossy topcoat! This alternate nail look accentuates the unique pigments and dynamic sparkle of the Zoya PixieDust™ colors in a shiny lacquered nail polish look."